Roofing, Ceiling, Wall. Home of Special Products. 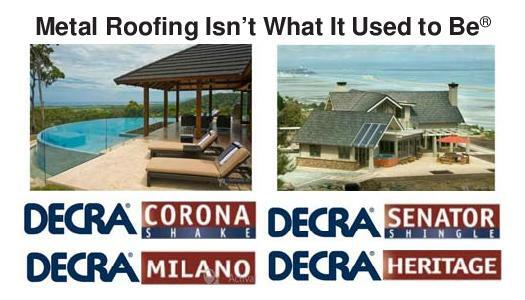 We can supply & install DECRA Roofing Systems nationwide. DECRA Corona Shake. 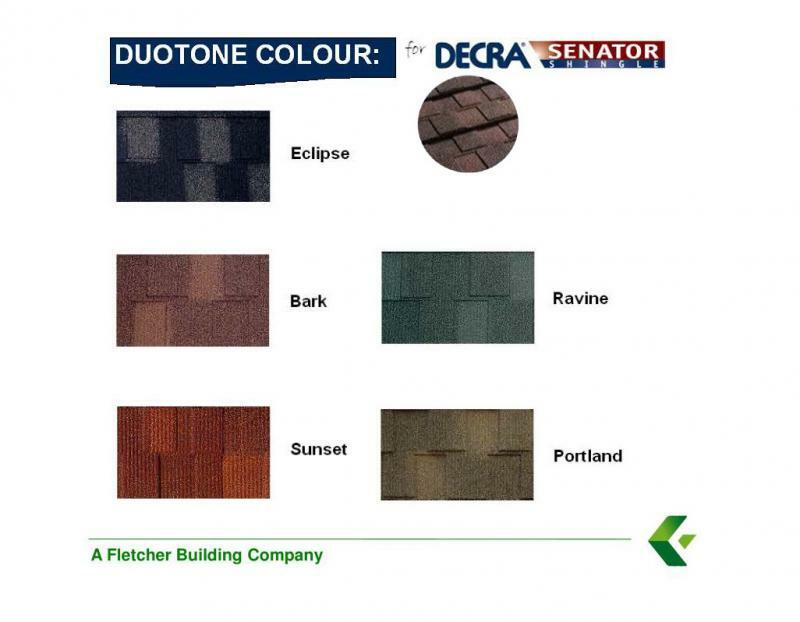 DECRA Senator Shingle. DECRA Milano. DECRA Heritage. DECRA Classic. 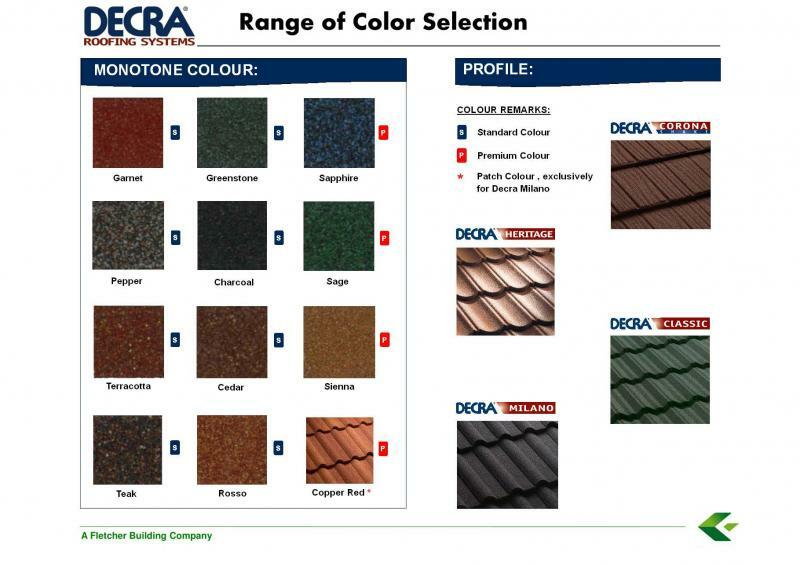 Also BP CANADA & CERTAINTEED Asphalt Roofing Shingles. Note: This is a Facebook Style NEWS FEED DESIGN Website. Stall No. 230, Ground Floor, MC Home Depot, 32nd Sreet corner Bonifacio Blvd. 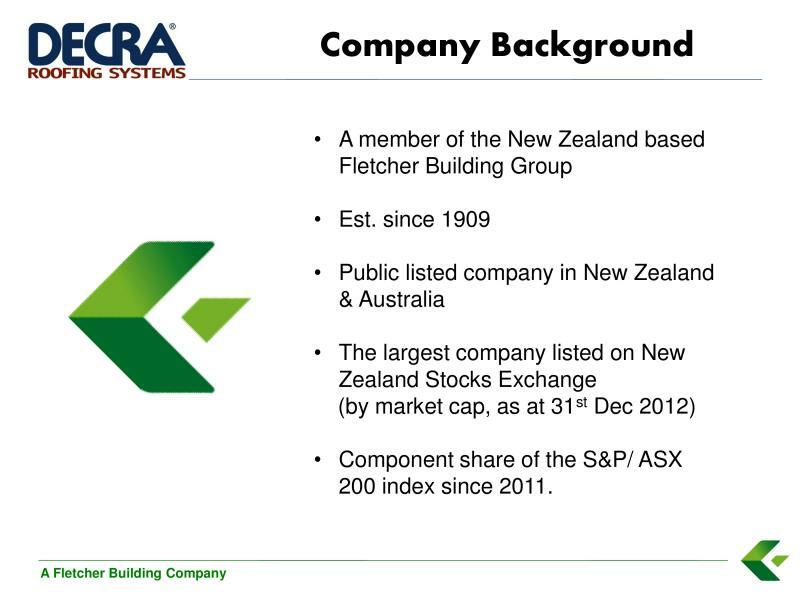 Complete Decra Information in a layman's language below. 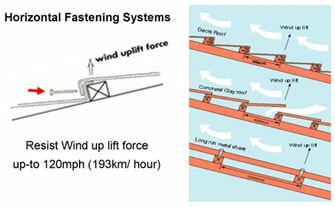 Detailed Technical Info also in the following link. 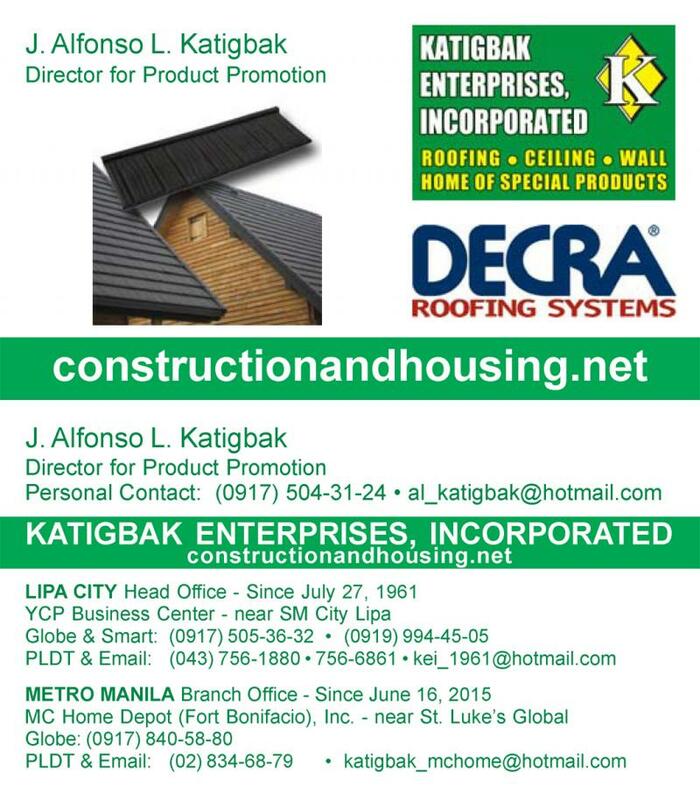 Please take note that I started this DECRA page by giving you a copy of my business card, so you will know how to contact me or my office teams in our Lipa City Head Office or in our Metro Manila Branch Office at MC Home Depot - Bonifacio Global City. 7 days weekly & 11 hours daily from 9 AM - 8 PM. 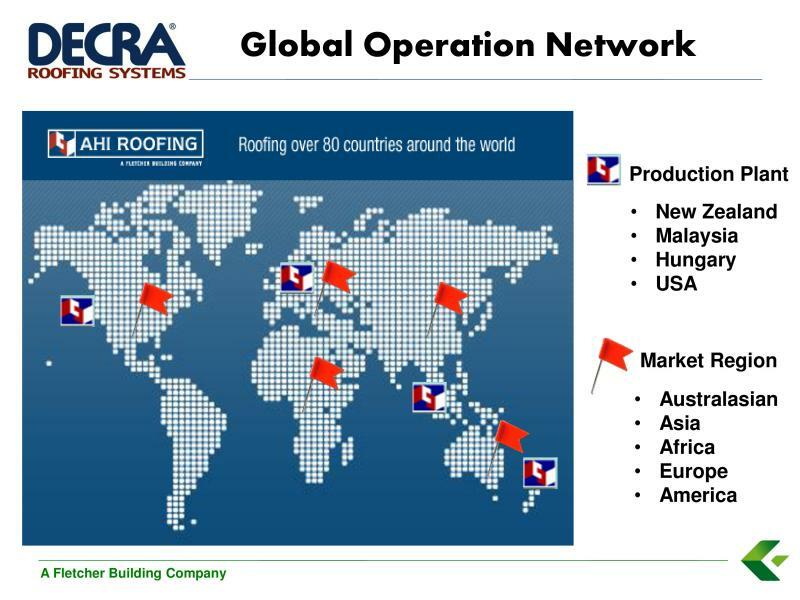 If you are looking for the highest quality of roofing & wood products in the world, then you are in the right website. 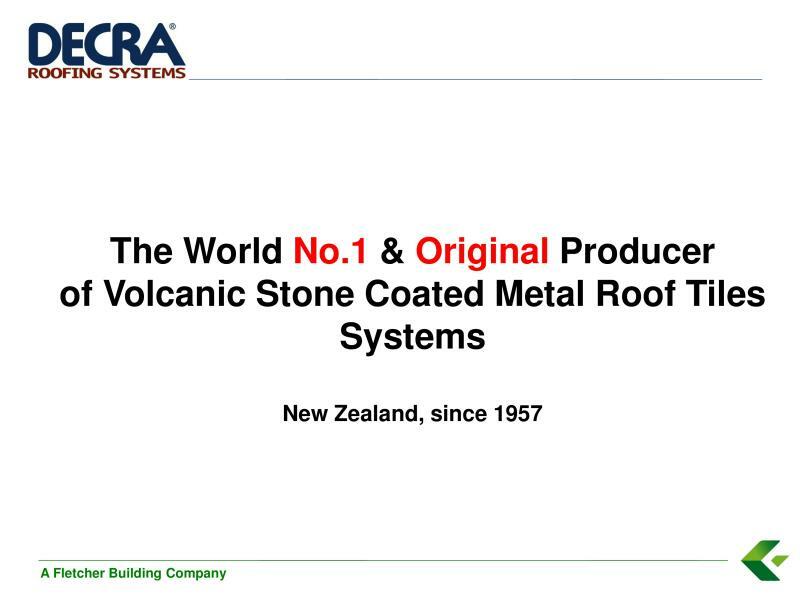 We sell Decra Roofing Systems - the world's number one & original stone coated steel roofing systems from New Zealand, Malaysia, Hungary, USA + BP- Building Products of Canada Corp. - asphalt shingles with Weather-Tite Technology. 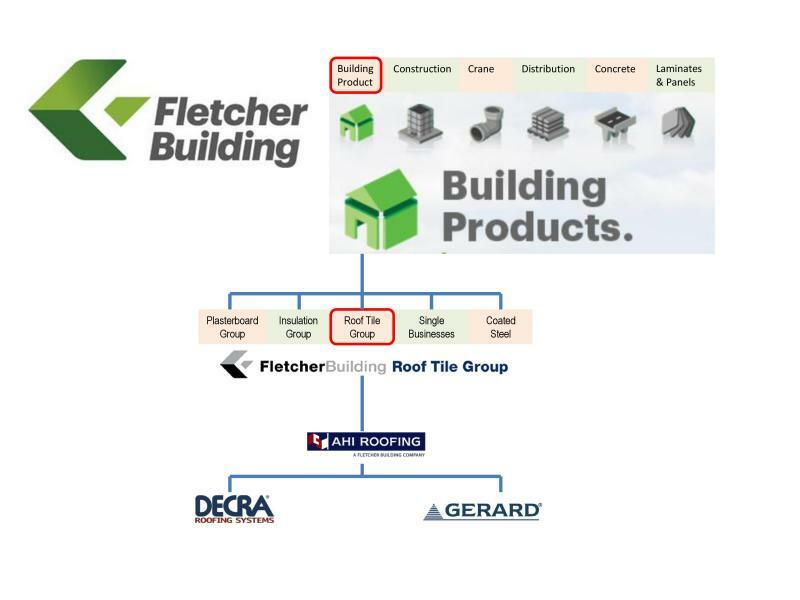 Our tag line is roofing, ceiling, wall, home of special products. 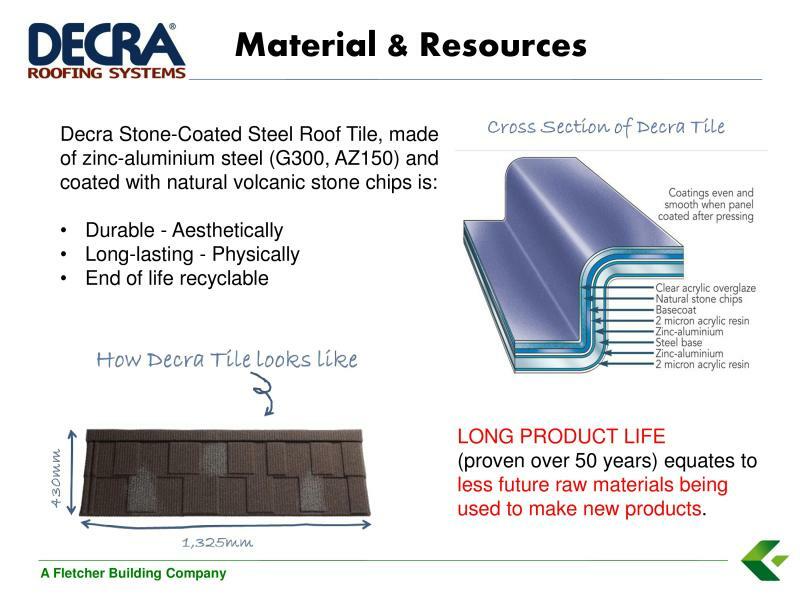 Let us begin with a discussion of Decra Roofing Systems. Please continue reading just like you read your Facebook News Feed. Page 2 is very technical. Pages 3 to 5 are just for Optional Reading - about my Advocacy. 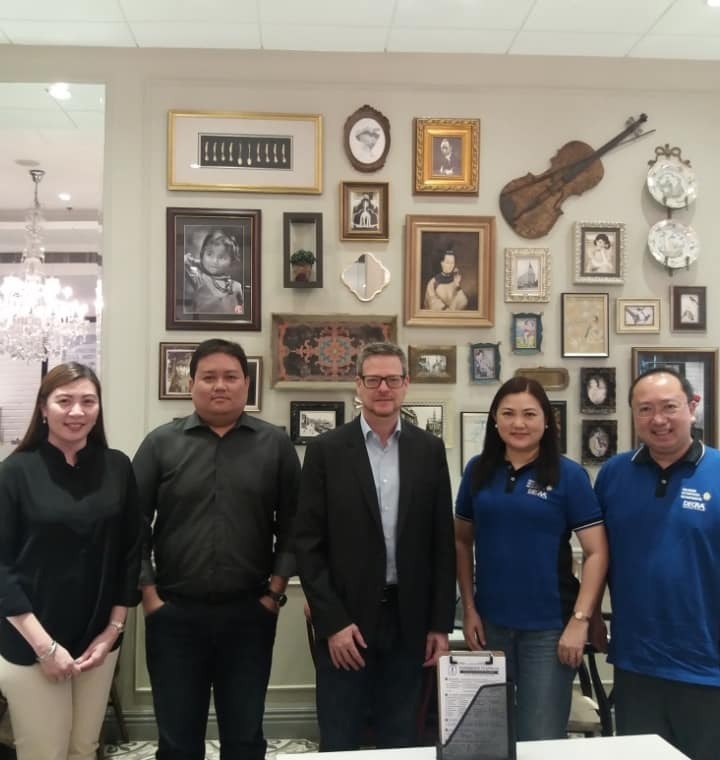 European Settlers to America in the 17th and 18th centuries brought traditional English, Dutch, French and German roofing styles to this developing country, recreating those styles from timber that was in plentiful supply. Cedar was split with an axe to make roof tiles or 'Shakes'. 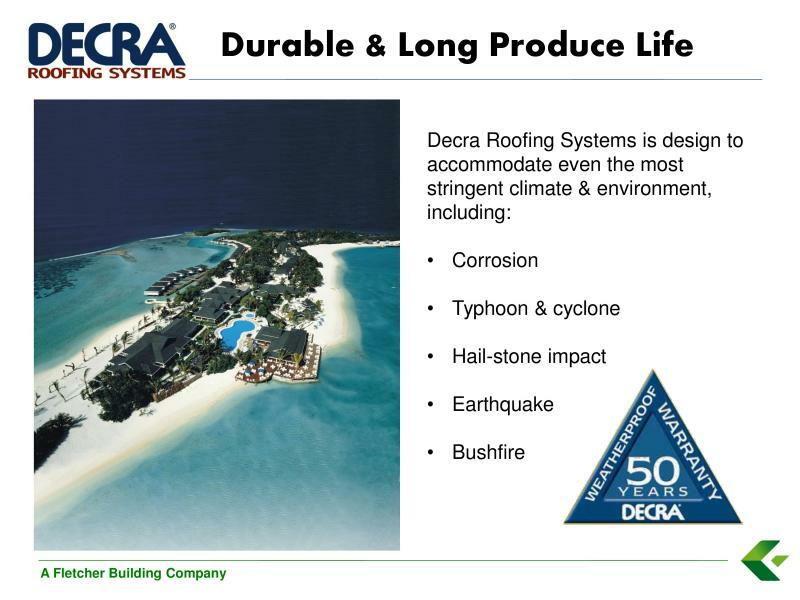 The natural aesthetic appeal of 'Shake' roofs has been re-created in the Decra Corona Shake, incorporating easy installation features. 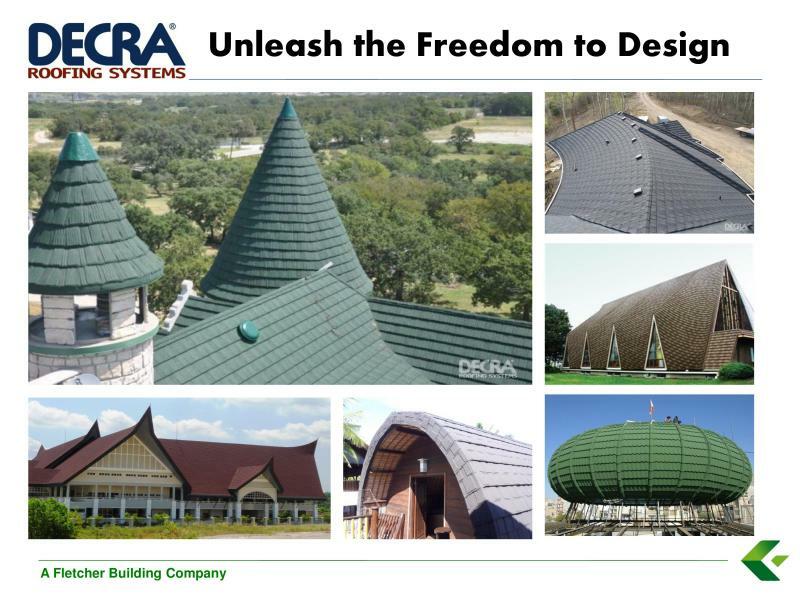 Choose a roof made with Decra Senator Shingle, and you've made the choice for a roof that is strong, durable and attractive. 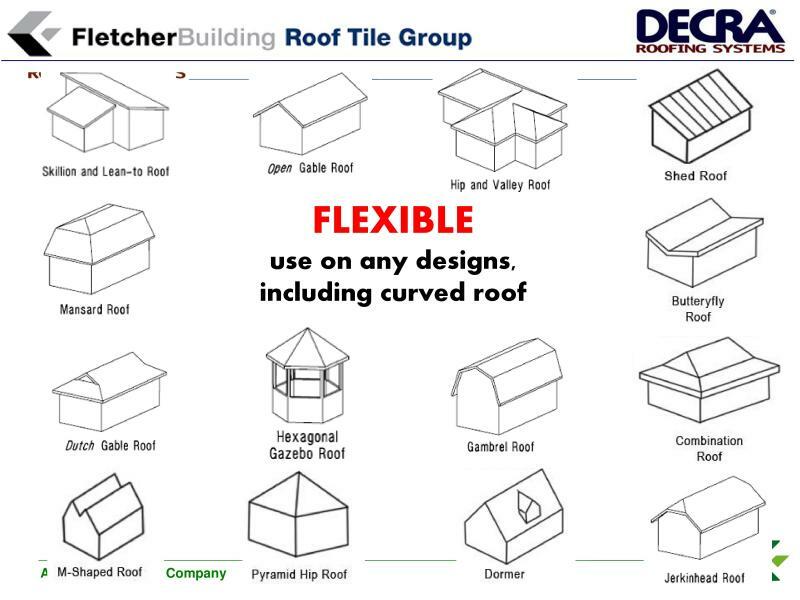 Other types of shingles, such as those made from timber, are expensive roofing systems because of their need to be installed over a plywood deck. In addition, Shingles retain their attractive appearance compared with many other shingle roofs because of their durable steel substrate. 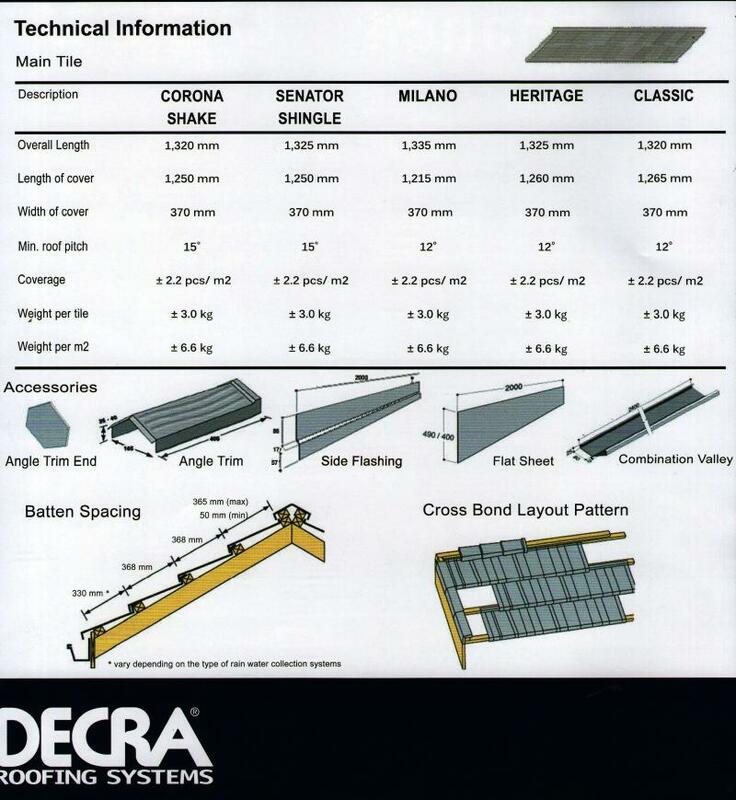 Using leading edge technology Decra Milano Tile has been created to extend our wide range of profiles. With a timeless look of traditional Mediterranean roofs, Architects and Specifiers will enjoy working with the soft curves and versatility of this strong inter-locking profile. 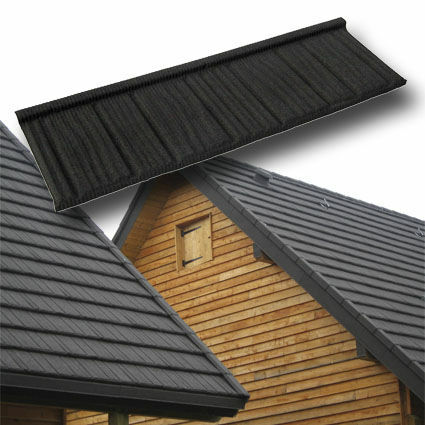 The Heritage roofing panel is pressure formed from steel, seven tile impressions are formed horizontally in one panel. Each panel is profiled to form an extremely strong overlapping and interlocking structure which is aesthetically pleasing. 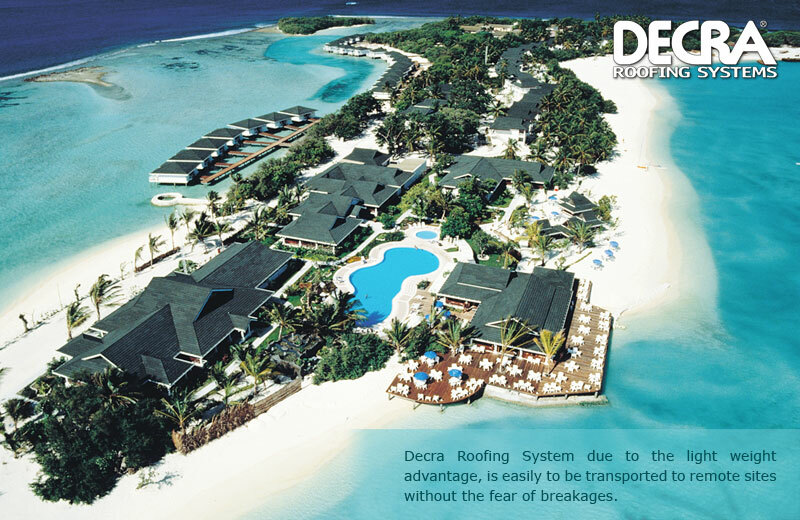 Decra Classic Tiles look good, last longer and are safe and secure in any environment. Classic Tiles can add to the style and security of any home or commercial building. 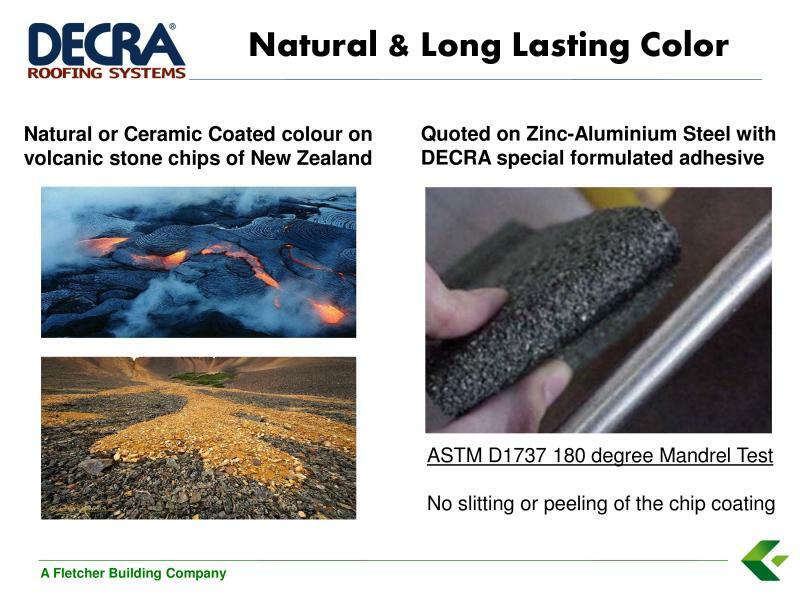 Each tile is pressed from high grade Aluminum-Zinc steel giving great strength, and the traditional profile is enhanced with the beauty of a natural stone chip coating.